IISD-ELA partners with a number of educational institutions to provide a platform for science education and innovation. We are working with a number of universities to provide undergraduate- and graduate-level field courses. The long history of ELA research combined with accommodations, logistical support and laboratory facilities make it an ideal place to teach field research techniques in topics such as limnology, biogeochemistry, fisheries and aquatic sampling. Lakehead University offers the Experimental Limnology and Aquatic Ecology through the Ontario Universities Program in Field Biology. The University of Manitoba and Trent University will jointly offer a university-based field course focused on environmental monitoring and water quality, sponsored in part by the NSERC CREATE H20 program. At the high school level, IISD-ELA offers a two-week Experimental Lakes Area Student Experience (ELSE) summer field course for eight grade 11 and 12 students. ELSE gives students a unique perspective into ecological literacy, freshwater research and systems thinking. Students work with their peers, two adult leaders and participating scientists through long days, observing, helping, asking, answering, participating and learning about environmental science, limnology, the “whole-ecosystem” concept, chemistry, ecological interactions, human impacts and more. Download our IISD-ELA ELSE brochure. 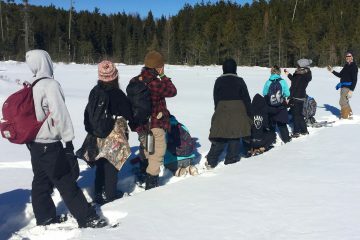 For more information on field courses at IISD-ELA please contact education@iisd-ela.org.